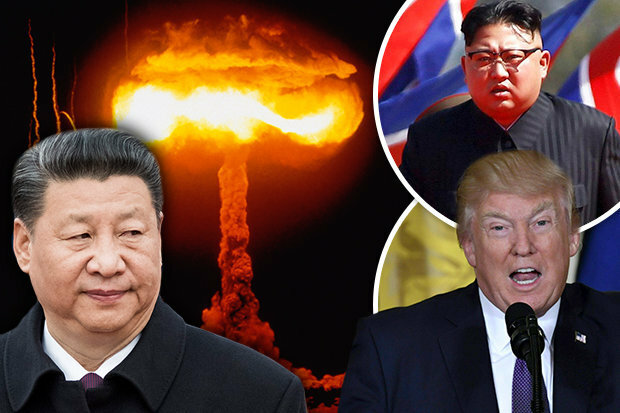 A war between the US and N.Korea is on the brink of breaking out, China has said in a desperate warning to the world. It comes as speculation mounted US President Donald Trump would launch a preemptive strike on the regime before this weekend. China’s foreign minister, Wang Yi, today said something drastic would have to be done to stop the world going down an “irreversible route”. Kim Jong-un is expected to oversee North Korea’s biggest nuclear missile test ever this weekend – something the US is reportedly planning on stopping. Intelligence officials have revealed the US placed two devices capable of firing Tomahawk missiles into the peninsula. American bombers have also been positioned in Guam ready to strike if necessary. And the US Carl Vinson has led a fleet of warships to the peninsula, along with Japanese allies. China itself has reportedly sent just under 200,000 troops to the North Korea border to prepare for the expected onslaught. Officials are said to be worried that a strike by the US on NK could spark waves of refugees flooding over the border. Yesterday, the US dropped the “mother of all bombs” on Afghanistan’s Nangarhar province in a bid to wipe out ISIS militants. There are suspicions the bomb – reportedly twice the size of the nuke dropped on Hiroshima – was used to send a message to Kim Jong-un that the US is serious about taking out its enemies with firepower.